The famous Yunnan Hongyao (red medicine) �dragon�s blood - enjoys the same high reputation as Yunnan Baiyao (white medicines). It is also the major element of the famous traditional Chinese medicine -�Qilisan�. In his book, �Compendium of Materia Medica�, Li Shizhen praised the dragon�s blood as �all-heal for invigorating the circulation of blood. It has the effects such as promoting blood circulation, removing blood stasis, wiping out swelling, and stanching blood. It can be taken orally or serve external use, and it is a special medicine for curing injuries, invigorating circulation of blood, and stopping bleedings. The Southeast Dracaena tree, which Dragon�s blood is distilled from, is a kind of evergreen arbor tree. As a rare traditional Chinese medicine, the use of dragon�s blood has a history of more than 1500 years. However, before Southeast Dracaenas were found in China in 1972, the dragon�s blood medicines used in China were mostly imported from Southeast Asian and African countries, and the price of it was extremely high. In Africa, the extraction of dragon�s blood from maguey plants has a history of more than 2000 years; however, the extraction of dragon�s blood from palm plants is something taking place quite recently. While as early as 1000 years ago, China began to record plants of the Dracaena family. Su Song wrote in his �Materia Medica of Tang Dynasty�: �Dragon�s blood is originally plants. The trees are as tall as dozens of feet and are good looking. Their resin oozes out from the wood and drops down like glues. After congealing, the resin gets the name - dragon�s blood. Its color is red and the harvesting time depends�. When we talk about domestic Dracaena and dragon�s blood medicine, we must mention a legendary figure � a famous botanist of China and the founder of Xishuangbanna Tropical Botanical Garden � professor Cai Xitao. Professor Cai was a native of Dongyang, Zhejiang province, and was born in an old and well-known medicinal family. He loved nature when he was a boy and he passed the entrance exam of Jingsheng Biological Investigation Institute of Beijing when he was young. He majored in Botany under the guidance of Mr. Hu Xianxiao, a famous botanist. In the early 1930s, Mr. Cai went deep into Yunnan, Guizhou, and Sichuan for investigations and collection of plant specimen. In order to enter Mount Daliangshan, he made friends with the chief of the black Yi people. In order to go to South of Yunnan, he ventured the risk of catching malaria and being caught by bandits, and finally set his feet on the uninhabited areas by pulling the tail of a horse. Professor Cai liked literature besides plants. When he was collecting specimen in Yunnan, he also wrote stories and novels such as �Puji � A Girl of the Miao Minority�, �Ladder � Diary of a Hostler� and �People in Mount Babuliangshan of Sichuan� etc., and his works were highly praised by Mr. Lu Xun. However, his accomplishments in literature also brought him disasters. In 1960, Professor Cai�s good friend, Wu Han, wrote a newly edited historical drama, �Hai Rui�s Dismission from His Post�; the word �dismission� was added according to Professor Cai�s suggestion. During the �Cultural Revolution�, �Hai Rui�s Dismission from His Post� was criticized; and the word �dismission� became the focus in the movement. Professor Cai�s life changed suddenly and was involved in harsh persecutions. In the 1970s, America invaded Vietnam, and China provided Vietnam with selfless assistance. All the botanical workers in Fujian, Canton, Guangxi, and Yunnan were looking for special hemostatic medicines in order to treat wounded soldiers. However, in spite of their backbreaking labors, they made no progress at all. At that time, Professor Cai was just �liberated� and restored his job. Having been over 50, he forgot all the unfair treatment he had suffered and led a group of young technicians to South Yunnan. They found a large piece of Southeast Dracaenas in Shihuishan in Menglian County of Simao District, Yunnan. Ever since then, homemade dragon�s blood came into being. Its medical effect is much better than imported ones; and the dragon�s blood processed from palm plants also filled a blank in the history of South China medicines. Because of this, after the death of Professor Cai, half of his bone ash was buried under the Southeast Dracaena he planted personally in Xishuangbanna Tropical Botanic Garden, and the other half of his bone ash was buried under the metasequoia he planted personally in Kunming Botanical Research Institute, in Henglongtan, Yunnan province. Southeast Dracaenas grow very slowly and they can grow no more than 1 cm in one year. However, they have the longest life span in all plants, which can lasts as long as 8000 years; therefore, they are praised by botanists as �the longeval God of trees�. 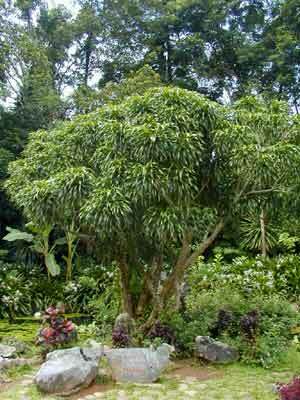 Southeast Dracaena is a kind of evergreen arbor. Once its barks are peeled, its red serum will flow down, like the blood of human beings, that�s why it got its name of �blood�. It mostly grows in limestone areas of higher sea level and can grow as tall as 20 meters. Its truck is short and thick, and its barks crack vertically, looking old and clumsy; but its branches and leaves are exuberant. Its dark green leaves gather on the top of the tree like ribbons; they are so verdant that it seems the green color would drop down. The whole canopy of the tree is very beautiful, and that is why we can see ornamental Dracaenas in many tourist sites, hotels and guesthouses. Today, the Southeast Dracaenas have been listed as a rare species and are forcefully protected by the government.